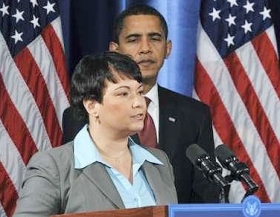 U.S. President-elect Barack Obama and Lisa Jackson, his choice to head the EPA, on Dec. 15. WASHINGTON -- Lisa Jackson, President-elect Barack Obamas nominee as EPA administrator, promised today to immediately revisit whether states should be allowed to enforce limits on vehicles emissions of greenhouse gases. The pledge sets the stage for an early challenge for automakers under Obama, who takes office Tuesday. Automakers and their allies oppose state-by-state regulation of greenhouse gases. They say such rules are an indirect attempt to regulate fuel economy, which is a federal responsibility. They also say state rules would add costs and create market chaos, especially for dealers near borders with states that dont have their own rules. In 2004, California adopted rules that aim to limit vehicle greenhouse gases. More than a dozen other states have taken steps to adopt similar rules. The industry fought the rules in federal courts but lost cases in California and Vermont. The rules were to have taken effect with 2009 modelvehicles. But in December 2007, the Bush administrations EPA denied California the waiver it needs to begin enforcing the state rules. At the same time, Congress and President George W. Bush enacted tougher federal fuel economy standards, which are to be phased in during the 2011-20 model years. The industry argues that a tough national standard is better than a patchwork of state regulation. States respond that they should have the right to impose their own limits. During his presidential campaign, Obama promised he would allow states to have their own rules. The principal greenhouse gas is carbon dioxide, a byproduct of burning fuel but also a natural part of the atmosphere. Jackson testified today before the Senate Environment and Public Works Committee, which is holding a confirmation hearing for Obamas EPA nominee. She is expected to be easily confirmed by the Senate. Jackson stated her commitment to revisit the greenhouse gas issue -- and to follow the dictates of science, the rule of law and expert advice -- in response to a question from Sen. Barbara Boxer, D-Calif., the committees chairwoman. The Alliance of Automobile Manufacturers has said it wants to work with the Obama administration to improve fuel economy and reduce greenhouse gases. But the alliance thinks a single national standard is the best way to do so, spokesman Charles Territo said. The alliance represents the Detroit 3, Toyota, Volkswagen and six other automakers.